The term "universal design" was coined by the architect Ronald L. Mace to describe the concept of designing all products and the built environment to be aesthetic and usable to the greatest extent possible by everyone, regardless of their age, ability, or status in life. However, it was the work of Selwyn Goldsmith, author of Designing for the Disabled (1963), who really pioneered the concept of free access for disabled people. His most significant achievement was the creation of the dropped curb - now a standard feature of the built environment. Curb cuts or sidewalk ramps, essential for people in wheelchairs but also used by all, are a common example. Color-contrast dishware with steep sides that assists those with visual or dexterity problems are another. There are also cabinets with pull-out shelves, kitchen counters at several heights to accommodate different tasks and postures, and, amidst many of the world's public transit systems, low-floor buses that "kneel" (bring their front end to ground level to eliminate gap) and/or are equipped with ramps rather than on-board lifts. Each principle above is succinctly defined and contains a few brief guidelines that can be applied to design processes in any realm: physical or digital. These principles are broader than those of accessible design and barrier-free design. In 1960, specifications for barrier free design were published. It was a compendium of over 11 years of disability ergonomic research. In 1961, the specifications became the first Barrier Free Design standard called the American National Standard, A1171.1 was published. It was the first standard to present the criteria for designing facilities and programs for the use of disabled individuals. The research started in 1949 at the University of Illinois Urbana-Champaign and continues to this day. The principal investigator is Dr. Timothy Nugent (his name is listed in the front of the 1961, 1971, 1980 standard). In 1949 Dr. Nugent also started the National Wheelchair Basketball Association. This ANSI A117.1 standard was adopted by the US federal government General Services Administration under 35 FR 4814 - 3/20/70, 39 FR 23214 - 6/27/74, 43 FR 16478 ABA- 4/19/78, 44 FR 39393 7/6/79, 46 FR 39436 8/3/81, in 1984 for UFAS and then in 1990 for ADA. The archived research documents are at the International Code Council (ICC) - ANSI A117.1 division. Dr. Nugent made presentations around the globe in the late 50's and 60's presenting the concept of independent functional participation for individuals with disabilities through program options and architectural design. In November 2010, the International Code Council publication Inclusive Design Guidelines, New York City (IDG) was released through the American Institute of Architects. The IDG is voluntary, prescriptive technical guidance that helps designers produce multisensory enhanced environments that accommodate a wide range of physical and mental abilities for people of all ages. This seminal universal design document is harmonized with A117.1 and a companion document to the New York City Building Code. It consolidates in one source, explicitly detailed design guidance that covers a substantial range of subject matter. The IDG is the result of collaboration between the New York City Mayor's Office for People with Disabilities, the International Code Council, Steven Winter Associates and a diverse team of contributors including prominent design firms, advocates and people with disabilities. Another comprehensive publication by the Royal Institute of British Architects published three editions 1963, 1967, 1976 and 1997 of Designing for the Disabled by Selwyn Goldsmith UK. These publications contain valuable empirical data and studies of individuals with disabilities. Both standards are excellent resources for the designer and builder. Disability ergonomics should be taught to designers, engineers, non-profits executives to further the understanding of what makes an environment wholly tenable and functional for individuals with disabilities. In October 2003, representatives from China, Japan, and South Korea met in Beijing and agreed to set up a committee to define common design standards for a wide range of products and services that are easy to understand and use. Their goal is to publish a standard in 2004 which covers, among other areas, standards on containers and wrappings of household goods (based on a proposal from experts in Japan), and standardization of signs for public facilities, a subject which was of particular interest to China as it prepared to host the 2008 Summer Olympics. ISO/TS 20282-2:2013  - Usability of consumer products and products for public use—Part 2: Summative test method, published 1 August 2013. The term Design for All (DfA) is used to describe a design philosophy targeting the use of products, services and systems by as many people as possible without the need for adaptation. "Design for All is design for human diversity, social inclusion and equality" (EIDD Stockholm Declaration, 2004). According to the European Commission, it "encourages manufacturers and service providers to produce new technologies for everyone: technologies that are suitable for the elderly and people with disabilities, as much as the teenage techno wizard." The origin of Design for All lies in the field of barrier free accessibility for people with disabilities and the broader notion of universal design. Design for All has been highlighted in Europe by the European Commission in seeking a more user-friendly society in Europe. Design for All is about ensuring that environments, products, services and interfaces work for people of all ages and abilities in different situations and under various circumstances. Design for All has become a mainstream issue because of the aging of the population and its increasingly multi-ethnic composition. It follows a market approach and can reach out to a broader market. Easy-to-use, accessible, affordable products and services improve the quality of life of all citizens. Design for All permits access to the built environment, access to services and user-friendly products which are not just a quality factor but a necessity for many aging or disabled persons. Including Design for All early in the design process is more cost-effective than making alterations after solutions are already in the market. This is best achieved by identifying and involving users ("stakeholders") in the decision-making processes that lead to drawing up the design brief and educating public and private sector decision-makers about the benefits to be gained from making coherent use of Design (for All) in a wide range of socio-economic situations. Design for All criteria are aimed at ensuring that everyone can participate in the Information society. The European Union refers to this under the terms eInclusion and eAccessibility. A three-way approach is proposed: goods which can be accessed by nearly all potential users without modification or, failing that, products being easy to adapt according to different needs, or using standardized interfaces that can be accessed simply by using assistive technology. To this end, manufacturers and service providers, especially, but not exclusively, in the Information and Communication Technologies (ICT), produce new technologies, products, services and applications for everyone. The European Design for All eAccessibility Network (EDeAN) was launched under the lead of the European Commission and the European Member States in 2002. It fosters Design for All for eInclusion, that is, creating an information society for all. It has national contact centres (NCCs) in almost all EU countries and more than 160 network members in national networks. EIDD - Design for All Europe is a 100% self-financed European organization that covers the entire area of theory and practice of Design for All, from the built environment and tangible products to communication, service and system design. Originally set up in 1993 as the European Institute for Design and Disability (EIDD), to enhance the quality of life through Design for All, it changed its name in 2006 to bring it into line with its core business. EIDD - Design for All Europe disseminates the application of Design for All to business and administration communities previously unaware of its benefits and currently (2009) has active member organizations in 22 European countries. Barrier-free (バリアフリー, bariafurii) building modification consists of modifying buildings or facilities so that they can be used by people who are disabled or have physical impairments. The term is used primarily in Japan and non-English speaking countries (e.g. 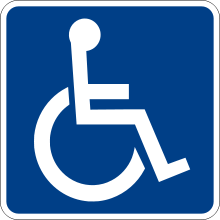 German: Barrierefreiheit; Finnish: Esteettömyys), while in English-speaking countries, terms such as "accessibility" and "handicapped accessible" dominate in regular everyday use. An example of barrier-free design would be installing a ramp for wheelchairs alongside or in place of steps. In the case of new buildings, however, the idea of barrier free modification has largely been superseded by the concept of universal design, which seeks to design things from the outset to support easy access. Barrier free is also a term that applies to handicap accessibility in situations where legal codes such as the Americans with Disabilities Act of 1990 Guidelines don't make specifications. An example of a country that has sought to implement barrier-free accessibility in housing estates is Singapore. Within five years, all public housing estates in the country, all of 7,800 blocks of apartments, have benefited from the program. Chile - Ley nº 20.422, "ESTABLECE NORMAS SOBRE IGUALDAD DE OPORTUNIDADES E INCLUSIÓN SOCIAL DE PERSONAS CON DISCAPACIDAD." Vietnam - National Law on Persons with Disability, enacted 17 June 2010. U.S. Department of Education's National Institute on Disability and Rehabilitation Research (NIDRR) funds the Rehabilitation Engineering Research Center (RERC) on Universal Design in the Built Environment. The current recipient is the Center for Inclusive Design and Environmental Access at the University at Buffalo. ↑ "Ronald L. Mace on NC State University, College of Design". Design.ncsu.edu. Retrieved 2013-07-26. ↑ Paul Harpur, 'From universal exclusion to universal equality: Regulating Ableism in a Digital Age' (2013) 40 Northern Kentucky Law Review 3, 529-565. ↑ "Center for Universal Design at North Carolina State University". Design.ncsu.edu. Retrieved 2014-11-14. ↑ "The Principles of Universal Design Version 2.0". Design.ncsu.edu. 1997-04-01. Retrieved 2014-12-14. ↑ Ease of operation of everyday products -- Part 1: Design requirements for context of use and user characteristics Archived May 26, 2005, at the Wayback Machine. 1 2 3 European Commission: Design for All (DfA). ↑ "The UK Council for Museums, Archives and Libraries" (PDF). Retrieved 2013-07-26. ↑ "Q-Drums". Qdrum.co.za. Retrieved 2013-07-26. ↑ European Design for All eAccessibility Network Archived December 11, 2003, at the Wayback Machine. ↑ "EIDD". Design for All Europe. Archived from the original on 2013-08-10. Retrieved 2013-07-26. ↑ "DISABILITY ACT 2005". Irishstatutebook.ie. 2005-07-08. Retrieved 2013-07-26. ↑ "Disability Discrimination Act 1992". Austlii.edu.au. Retrieved 2013-07-26. ↑ "Loi n°2005-102 du 11 février 2005 pour l'égalité des droits et des chances, la participation et la citoyenneté des personnes handicapées" (in French). Legifrance.gouv.fr. Retrieved 2013-07-26. ↑ "Disability and the Equality Act 2010". Direct.gov.uk. 2013-05-30. Retrieved 2013-07-26. ↑ "Accessibility for Ontarians with Disabilities Act, 2005". E-laws.gov.on.ca. 2009-12-15. Retrieved 2013-07-26. ↑ "NIDRR Rehabilitation Engineering Research Center". Rectech.org. Retrieved 2013-07-26. ↑ "Center for Inclusive Design and Environmental Access web site". Ap.buffalo.edu. Retrieved 2013-07-26. ↑ "Center for Inclusive Design and Environmental Access in University at Buffalo". Ap.buffalo.edu. Retrieved 2013-07-26.